Brief Synopsis – A young boy raised by apes in the jungles of Africa is found by an anthropologist and his daughter. My Take on it – In the early part of the 90’s Disney had numerous hits, but they hit some bumps along the way. This movie was a return to top form for them and it shows in every aspect of an animated movie. The animation is done superbly and instead of having Tarzan swing across the jungle by vines, animation allowed them to make him glide thru the jungle like a surfer or a skateboarder with such fluid motion that it’s a pleasure to watch. The characters are done very well. This movie mixes human characters with characters from the animal kingdom and the transition between the two worlds works very well. I like how the main storyline is about Tarzan’s personal dilemma as to which world he belongs to. The narrative and the songs help us to identify with his quandary. The music in this movie turns back to some of the earlier Disney tunes from the 90’s and Phil Collin’s soundtrack is amazing. The songs Two Worlds, You’ll be in My Heart, Son of Man and Strangers Like Me are all great. You’ll be in My Heart also won an Oscar for Best Song. This was the last Disney song to win that award until they won this past year for the song Let it Go from Frozen (2013). Bottom Line – Great animation, fun characters, nice story and excellent music. Highly recommended! 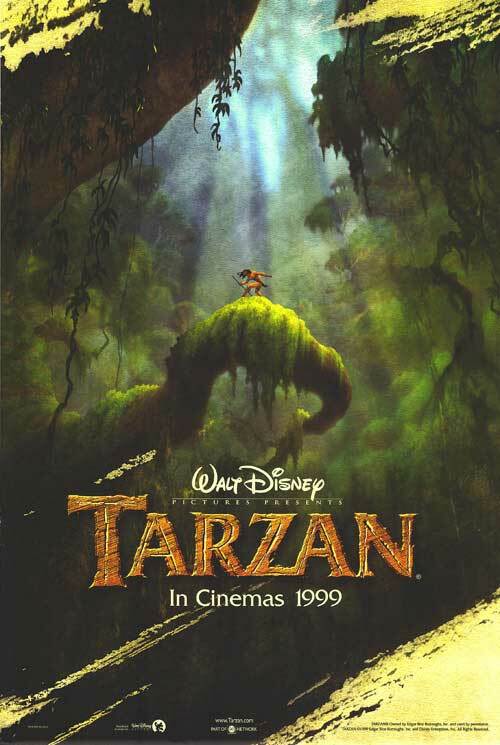 Tarzan is a delightful late-90s Disney flick, with – as you rightly alluded to – a brilliant soundtrack. Unashamedly, I’ve got those four songs in my iTunes library! Great work Rob.